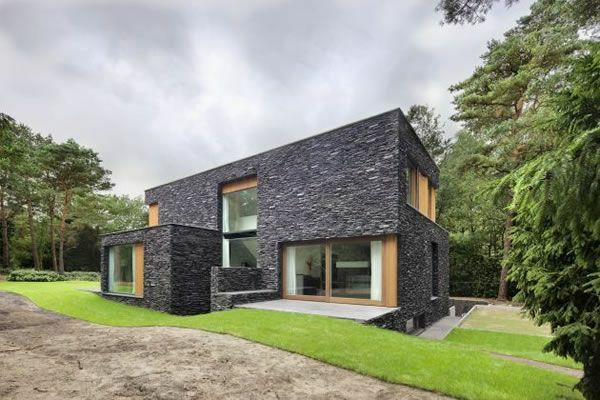 Residential project House in the Woods was label as House of the Month 2014 by Architectural Record. The artful house was designed by William Reue Architecture at the base of the Shawangunk Mountains, in Ulster County, New York. Responding to the client’s values of order, beauty, and environmental stewardship, the property serves as a personal refuge for someone looking to disconnect from routine and connect with nature and the wilderness. “The residence is the result of the studied relationship between two opposing geometries – a long sculptural wall clad in Cor-Ten weathering steel and a mass of stratified bluestone that appears to have emerged from the boulder-strewn earth. Locally-sourced materials and strategic siting stitch the house into the natural world while contributing to its sustainability for the modern one.” Interior is pretty much inspired by the wonderful natural landscape. Tones of browns, beiges and greys adorn the furniture, walls and floors. An uncomplicated design line defined the living space, which opens to the endless maze of trees. The view is absolutely inspiring, no matter the season.